Builder's Base Strategy - BH5...stay or upgrade to BH6? I was all set to put together a video on Mass Beta Minion (MBM) today - I've been saving replays all week from all of my games. For some reason, the "BH5 - Should I stay or should I go?" topic has been coming up a lot on the forums, so I decided to address this topic once more. A lot of the forumers are convinced that you simply can NOT max/near-max BH5 without it being a horrible experience. The moment anyone complains about unfair matches, the immediate response is to upgrade to BH6 or accept your fate. I've said it before and I'll say it again - there is absolutely no reason why you cannot max or near-max BH5 if you choose to do so. The key to being successful, however, is to have decent troops, a decent base design, realistic expectations, and patience. Ok - We are officially on day number two for our hyper-rush game. Yesterday, I cleaned up the much neglected main game base for Phoenix Abyss and picked up a couple hundred more gems. So, I decided to put some gems into buying two more days of lootable attacks (in other words, I gemmed the attack timer twice so my attacks yielded resources) BUT not before I trophy pushed to 572 cups. You still have to rush smartly. There is an art to rushing on a SuperCell game, whether it is Clash of Clans, the CoC Builder's Base, or Boom Beach. A smart rush follows a set of minimum rules as you advance through the Tower levels. The rules should make it organized and enable you to function at the next level of play. Time for a quick status update on the Builder's Base games! Noctaire, my main game, continues to upgrade everything to BH6 levels. The last troop upgrade for Bombers is underway, leaving only the Cannon Cart. I've never put much stock in the Cannon Cart, so it's still level 1. I'll begin upgrading it this weekend though. The air defenses are all level 6, and both mines and traps are maxed, so I moved on to the Archer Towers; the last one wrapped up yesterday. Next on the list are the Double Cannons, just to add a little grief to inbound Battle Machines. 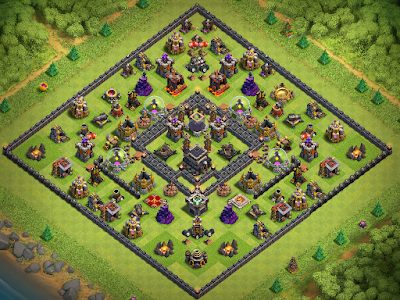 It's been a while since I posted my original rendition of the TH10 base I called "The Raven". The design was based around Aphrodi's original "Crows" design. Over the last several months, it's undergone a number of small changes. I thought it was overdue to bring it back to the blog. One big change - I've taken the design and applied it to one of my TH9 games as well. 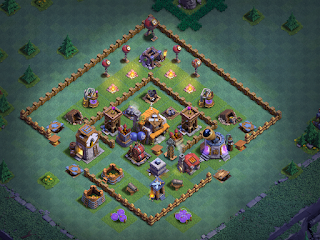 As such, the base can now be used for either TH9 or TH10 as it essentially "grows" with your game. The Raven is an open base design that relies on pathing and distraction to decimate opposing armies before they reach the core. It's primary goal is to protect the dark elixir storage; gold and elixir are less important at higher TH levels, so they become distractions and are dispersed to reduce potential losses. Ok - this topic is raging on the forums and some players just don't get the issue. Players are complaining about being matched up to higher level players and being unable to win matches. Every time a player loses a match, he/she drops trophies. The lower the trophies, the lower the daily loot earnings. The less loot you earn, the longer it takes to upgrade your base. 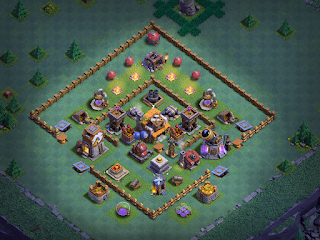 There's a sweet spot for each level of Builder's Hall where that BH sits comfortably and will maintain trophies if the player has upgraded smartly. For BH4, the range runs 1000-1800 cups; for BH5 it goes up to 2500 or so trophies. BH6 runs 2500-3200 or so. If you can reach these trophy levels, just run your 3 lootable raids each with a solid win:loss ratio...you'll hold up just fine.